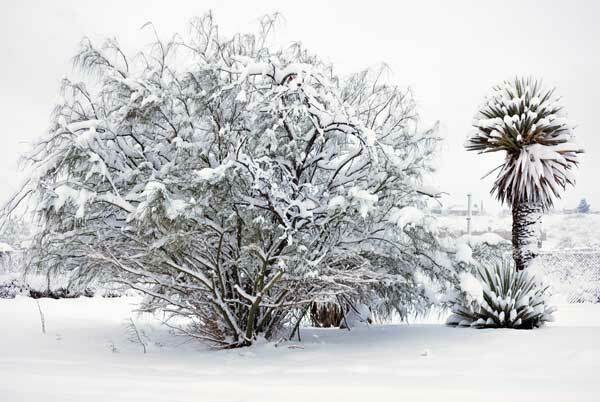 The quiet view across the street from my house after a snowfall in the desert. I returned to my workbench the other day and unearthed a project I started over a month ago. I seem to experience a holiday lull in hobby activity each year as outside activities increase and a family member or two travels to this tip of far west Texas for a visit. Old Man Winter played a trick and dumped eight inches of snow on the region to shut things down for a couple of days. I also dealt with a wonderful blog software update here that had gone awry. It was very good to sit at the workbench again and make progress. This Westerfield Pennsylvania Railroad X23 box car kit build was launched in late November. The body details assembled quickly. I did encounter an alignment issue when the roof pieces were attached, but it was quickly fixed. These are models of distinctive prototypes. 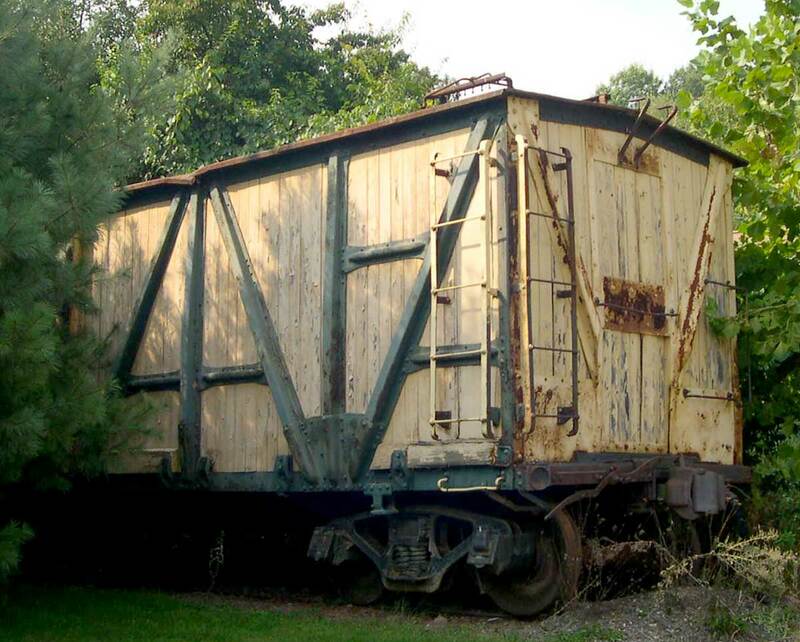 This was the first 40-foot box car on the Pennsy system, with over 6,900 built in 1912-13 for Lines East and West, Vandalia Line and Cumberland Valley. The body is a one piece casting that minimizes assembly. My model had a noticeable bow in each of the car sides so bulkheads were made from 0.040-inch styrene sheet and a short piece of square stock. These were installed. at a few key points in the car body. When you add pieces like this to eliminate warpage, think ahead to consider the car weight thickness and placement. The pieces used here were made to fit in the upper cavity of the interior and leave space at the bottom for the car weight. The underframe piece will straighten out minor warping issues along the bottom of the casting. The car body was mostly finished in an afternoon or two of work before the holidays. I sat down to work on the underframe details the other day. 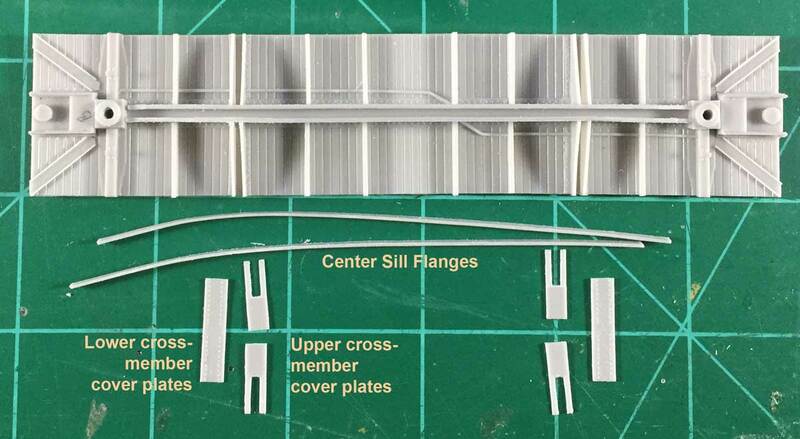 A challenge with many resin freight car kits is identifying the parts that are called out in the instructions. The first pieces to install on the underframe are the center sill flanges, the upper crossmember cover plates, and the lower crossmember cover plates. Two of these parts were quickly identified and prepped for installation, but I wasn’t certain of the lower crossmember cover parts. I figured it out based upon the quantity and size of the parts that were needed and what remained in the kit box. The following images illustrate the parts and placement. Brake system installation is next and the instructions are fairly straightforward on the components and where they fit. I had some difficultly understanding the placement of the components connecting the brake cylinder with the handbrake rod, but I figured it out. I need to install the couplers and trucks, then check the coupler height before wrapping up a few more steps. The running board parts are ready to install, as is the brake staff. I’ve been warned that the ladders are delicate and to take my time on the work so it goes together. I hope to complete all the details in the next couple of days. At least I have a prototype photo to help with the ladder details. I found this X23 near Coshocton, Ohio many years ago and snapped a number of photos. The PRR X23 box car is featured on my Westerfield Models quick guide for 1920s era models. It’s good to move another model along for service on the Wheeling Freight Terminal. I think the holiday lull recharged my hobby energy and enthusiasm as I’m looking at a few projects to dive into next. Eric, I suggest you check the fit of the floor in terms of its depth in the body cavity. With the four reefer versions I build I had to take material off of the inside of the floors for proper alignment of couplers and the way the underframe needed to look. My friend Randy Anderson designed the tool or fixture to bend the metal for the ribs and then bents the metal for all of the ribs for Al. I built my model tears ago using the old Cannonball Car Shops ends and side parts with scratch built roof and doors. I used Westerfield’s X25 underframe. This car will really fit well with your era and location. Thanks for the tip, Bill. I check the floor fit before I start any underframe details. As the coupler mounting area spans the underframe and the end sill, I use a single-edge razor blade to check how the surfaces meet up. This kit was fine. I’m looking at your proto photo and thinking that is not a PRR paint scheme but just some MoW colors. Can you confirm info on that car you discovered? It’s just as difficult to find Pre-Depression prototypes as models, and even harder to find useful paint or weathering guides. Any additional info can help. Hey Dave! Several members of the Pennsylvania RR Historical & Technical Society agree that the Pennsylvania RR Freight Car Color changed over the years. It was originally a brighter orange shade and morphed toward red then brown as the decades rolled along. Check out this page on PRR paint at the Keystone Crossings site. Scroll down a bit for the freight car color data. Harold Oakhill encountered a similar “color shock” when he built and painted some PRR XL box cars for his layout. Check out his blog post and comments on the freight car color. Thank you Lord, as this is a picture of my boxcar I just brought home and is now sitting in my side yard! Where did you see this at? Do you have any more pictures? Please contact me at my email asap because I was not provided much information when I purchased it. It doesn’t even have the trucks. Thanks you! Previous Previous post: What’s in the yard?